I happened to catch some midday radio on KUOW, my local NPR station today and I was surprised to find myself listening to a piece on how the UK recession is impacting people in Truro, Cornwall. When the segment finished, the presenter then welcomed the “new listeners to the BBC World Service in Seattle”! Apart from the obvious fun of being personally welcomed to enjoy a new radio show (he was talking to me, right? ), as I mentioned recently, we are traveling to Cornwall in March. I’m right in the middle of putting together an itinerary for this trip so it was particularly timely to hear Claire Bolderson describe the pretty cobblestoned center of Truro and hear the cathedral bells chiming in the background. The news segment itself was not so much fun: Cornwall is struggling in the current economic climate, particularly with respect to declining employment. 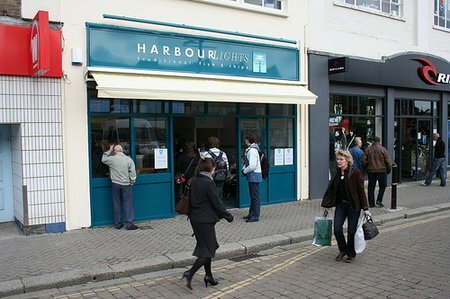 One bright spot in the report was an interview with the owner of the newly-opened Harbour Lights fish-n-chip shop (pictured above). In the spirit of synchronicity, I’ll see if we can add a lunchtime visit to this cafe while we’re in Truro. This entry was posted in International Escapades and tagged BBC World Service, Cornwall, UK, United Kingdom on February 17, 2009 by wandermom. @Jamie: you may think swimming in the sea in March in the UK is insanity. I, on the other hand, can totally understand the attraction. It’s brisk and bracing and an excellent respite from damp dreary weather. Thanks for the suggestion to visit St.Ives.